There are few soups that can get away with being cold. 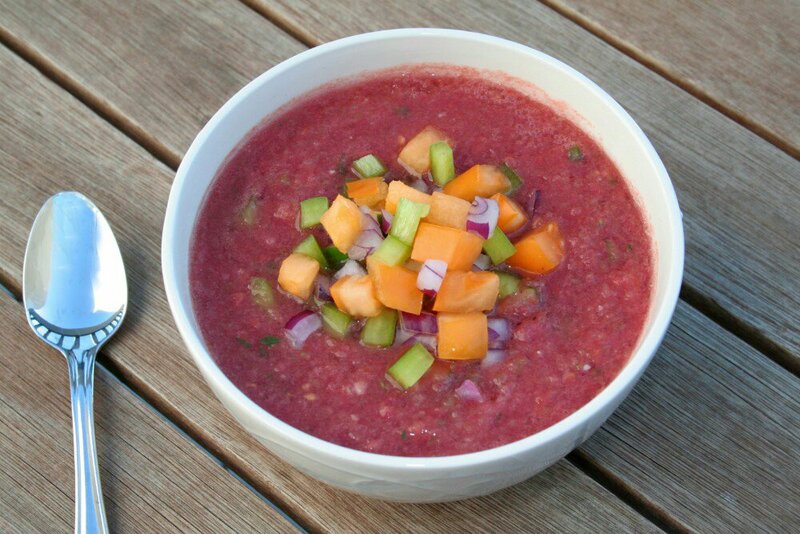 As a favorite of this small group, Gazpacho often outshines the others as the most typical cold soup. However, I believe it’s really just an excuse to eat soup on a hot summer day. Since tomato is the star of this famous Spanish specialty, August is the perfect time for a homemade batch. Garden fresh bold red tomatoes are juicy and flavorful, making them the ideal candidate for this simple soup. This is a combination of two recipes: the Gazpacho recipe from “The Art of Good Cooking” and an unpublished recipe I found titled “Ann Thayer’s Gazpacho.” Each recipe is perfectly fine on its own but I wanted to combine the two as a tribute to the friendship between my grandmother and the late Ann Thayer. Ann was one of the few friends of my grandmother that I knew as a child and consistently visited on trips to NYC before I lived here. She met my grandmother in one of James Beard’s cooking classes and in her words “saw that Paula could cook circles around everyone else in the class” and immediately paired up with her. Although Ann was never apart of the famous “cooking world” of journalists and chefs like Beard, Craig Claiborne, and Andre Soltner that my grandmother often entertained, she was one my grandmother’s closest friends and stood by her side through her sickness and eventual death. The main difference between the two recipes is the amount of liquid and bread used. The unpublished recipe blends pieces of bread into the base along with the tomatoes and vegetables. I decided to skip the bread because I just don’t think it’s necessary. If your tomatoes are ripe and your vegetables fresh and crisp, they should easily be the focus of this classic farm fresh chilled soup. Combine all ingredients in a large bowl. Pour into blender and blend until smooth (this may need to be done in batches). Taste for seasoning and correct. Place in refrigerator and chill. Serve as cold as possible with toppings.